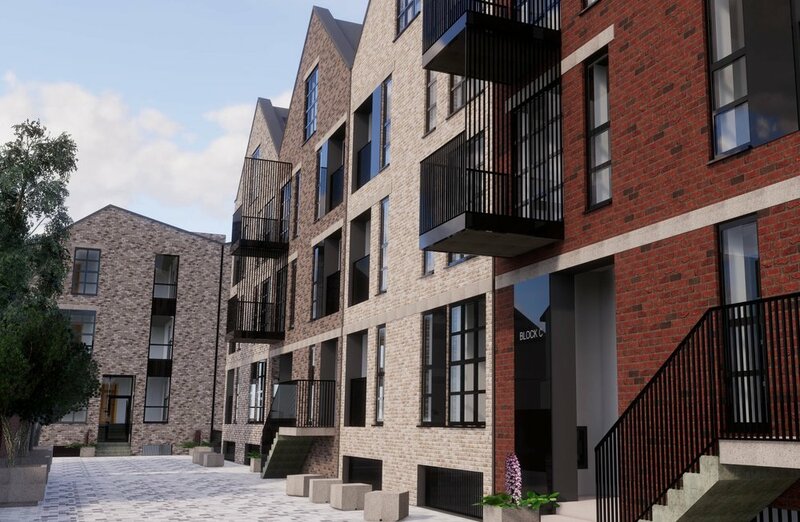 This residential led redevelopment of Hertford Mill is the result of a unique joint venture between a local business and developer to bring this site forward for new homes whilst ensuring continuity of the business and employment within the town. The proposal sees the demolition of the existing buildings on the site and the construction of 8 apartments buildings and 3 terraces of family homes set within a new landscaped setting. The apartment buildings towards the rear of the site and adjacent to the railway line have borrowed from the industrial aesthetic to create a strong new street scene that pays homage the former buildings and uses. To the front of the site and along Tamworth Road a more traditional house typology reflects the adjacent late Victorian and Edwardian houses. New hard landscape accommodates some the additional parking not serviced by the semi-basement car park. New street trees, planters and furniture is designed to ensure a pedestrian friendly environment within the site. The proposed ground floor of Building H, to the west of the site, retains a new B1 employment use with the existing businesses relocating to Meads Lane business park. Client: Rockwell & TR Hertford Ltd.
Richard Watson, Giulia Simone, Lauren McCann.